"The devastation wrought by Nicolas Maduro, the tragedy of the humanitarian situation there bought out solely by Maduro making the choice to bring in the Cubans, to allow Russians to intervene in the country -- those are things that are destroying the lives of young people in Venezuela," Pompeo told Peru's El Comercio newspaper Sunday. "This is not something that has happened in the last weeks or months. This is devastation wrought by the Cubans, the Russians and Maduro over the last years. I'm very hopeful that it'll come to its conclusion quickly," he said. 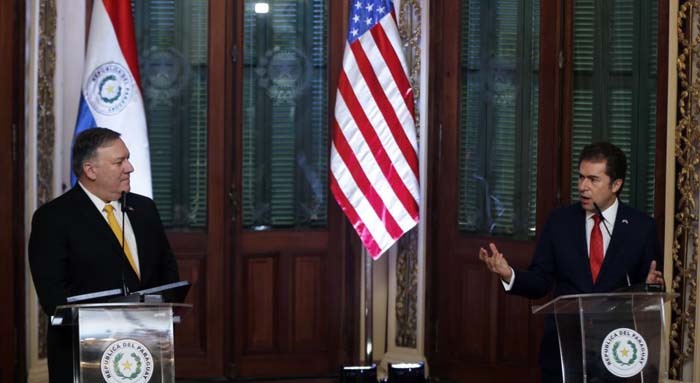 Pompeo again said all options are on the table when it comes to U.S. involvement in Venezuela. But the Trump administration has not said under what circumstances it would use military action. The U.S. has already imposed a number of sanctions against some Venezuelan officials and the country's oil sector. Pompeo's stop in Colombia will include a visit to the border city of Cucuta, which is separated from Venezuela by a bridge. Tons of U.S. food, medicine and other relief supplies are sitting in warehouses in Cucuta, waiting to be delivered. Maduro has refused to let U.S. aid into the country, calling it the vanguard of a U.S. invasion. "State-owned enterprises, companies deeply connected to the Chinese government that want to put infrastructure, telecommunications infrastructure inside of your country... we want to make sure everyone has their eyes wide open," Pompeo said. The United States has accused Chinese computer and telecommunications firms, including Huawei, of installing spyware in its products -- charges the companies deny. Pompeo told the Peruvian newspaper that if the country uses Chinese technology, its information would be "in the hands of President Xi [Jinping] and the People's Liberation Army."